Up until now I have had no evidence other than hearsay (albeit reliable hearsay) that Cordia was being logged to fuel the boat/canoe building trade. Today I came across more pit sawing sites in N5 and in one of them we found an oar. It must have been about 15 foot in length. 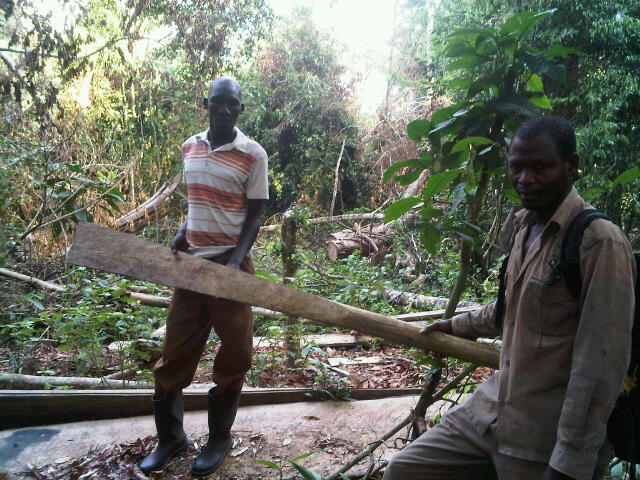 These pit-sawyers don’t rush the work they do; in fact many set up camp for the night in the forest. I have seen and smelt the faint aroma of firewood in W21 long after the cinders have been stamped out but I was genuinely surprised by what we discovered today in N5. Our transect line happened to go along a steep hillside. I was carefully taking baby steps, digging my boots into the soft mud to grip the path while Moses was gliding effortless along swinging his Panga and clearing the way. On the left of our path was a sharp drop. Eighteen metres below us, obscured by some small trees at the bottom of the hillside was a pit-sawing site. Skidding down after Moses clutching at the passing bushes with one hand and the tape measure in the other, I landed clumsily in a heap. There I saw what can only be described as a functioning campsite. 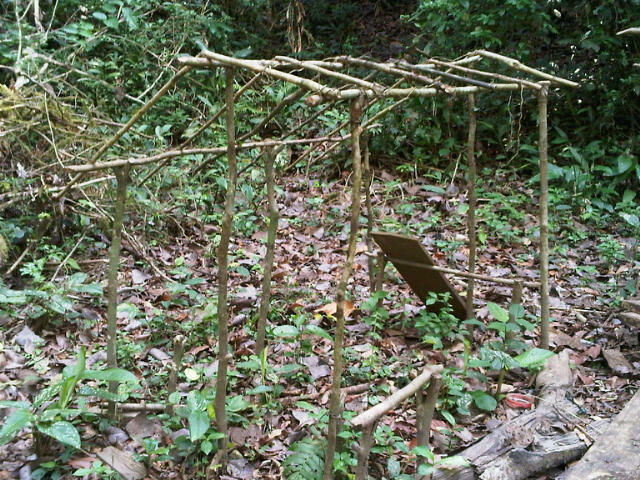 We discovered a makeshift tent: the frame was made out of thin branches in the shape of a small Wendy House. Moses told me they use this to drape material over and sleep inside to protect them from the elements. 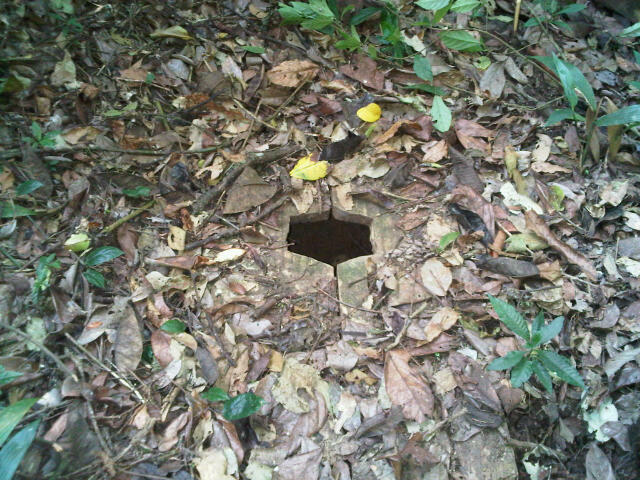 There was even a purpose-built latrine, not just a hole in the ground, but someone had taken the trouble to lay wood around the shallow pit and finally the obligatory campfire for making tea; cooking and staying warm. 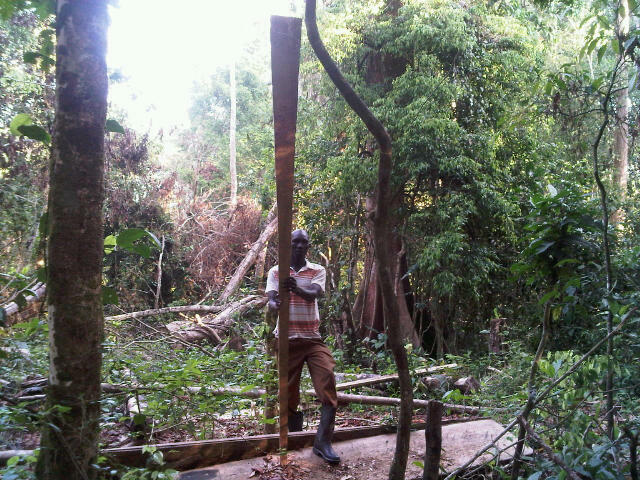 I often wonder whether the pit-sawyers run and hide when they hear us approaching and if they’re watching us from afar. Part of me thinks it’s possible; but the other half doubts that anyone could hide from Moses. He is after all an ex hunter and nothing escapes him. Line One proved to be hard work (Kaazi muzitoe) and by the time we had laid our plots and negotiated the Krypton Factor Assault Course Plus back home we were dirty and very tired. Once back in camp, I saw Isaac dismount from a Boda Boda (motorbikes used as a taxis). He was cradling the right hand side of his jaw, with the palm of his hand. For the last few days he’s had terrible toothache. So bad, he’s been popping antibiotics in the hope of easing the pain. His appetite has diminished and he’s not been his usual bubbly self. He’d just come back from Masindi where he went to see a dentist. “So how do you feel?” I asked. He looked at me bleary eyed, his jaw swollen, “Much better, they took it out,” he mumbled. Here in Uganda, if you have toothache, there is no such thing as saving a tooth, if you are in that much pain, they’ll yank it out with a pair of pliers – job done! He forced a smile, wincing at the pain as the aesthetic began to wear off. “I’m going to bed, I don’t feel good.” He made his excuses and slowly walked towards the main house. Poor love, I sympathise, toothache is horrendous. I remember before my root canal treatment I was in agony, everything hurt: my ears, throat, head, no amount of prescriptive drugs or alcohol could numb the pain.